Video posted on social media purports to show rebel Libyan National Army forces preparing for an assault on Tripoli airport. The UN-backed government says 21 people have been killed and 27 injured in fighting around the capital. Libya has suffered instability and violence since the downfall of Muammar Gaddafi in 2011. 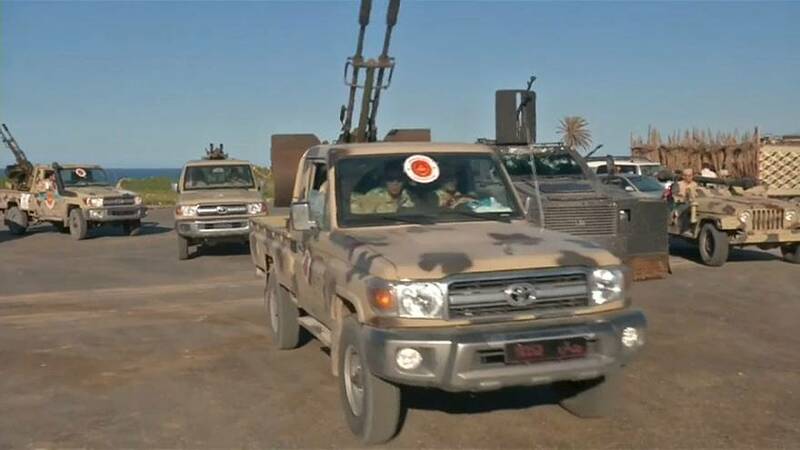 LNA forces under the command of General Khalifa Haftar have been steadily advancing from the east with the aim of taking control of the capital. "I mean I don't see any lack of intent (from Haftar's troops)," said Kamran Bokhari, director of the Center for Global Policy. "I'm more concerned about capability, and that's where I'm not sure whether his (Haftar's) forces are up to the task. I mean he was able to take over much of the southwest, I mean easily. Tripoli, he's going to face a lot of resistance. So we're looking at a long, protracted conflict." Other footage on social media appeared to show an American vessel leaving a site near Tripoli. The US said the move was due to security conditions on the ground. A small contingent of American troops has been in Libya to help combat Islamic militant groups.